Eastman Kodak Company is engaged primarily in developing, manufacturing and marketing traditional and digital imaging products, services and solutions. OLEDs were originally discovered, developed and patented by Kodak, and the company has been involved in licensing and producing OLED screens. Kodak released the world's first camera to use an AMOLED screen, have released the largest (7.6") OLED photo frame and have licensed its OLED technology to over 20 companies. We have published two interviews with Kodak's OLED systems, one about OLED display and one about OLED lighting. In September 2009, Kodak sent us an update on their OLED lighting and displays program. In December 2009 Kodak announced that they have sold all of their OLED business to LG Display and is no longer involved with OLED research. Dr. Ching Tang and Steven Van Slyke are two OLED pioneers - in fact you can say that they invented OLEDs back in the late seventies when they worked for Eastman Kodak. The two wrote a seminal paper on OLEDs in 1976 that has been cited in more than 5,000 publications, and have been inducted to the CE hall of fame. The two scientists have been named for this year's citation laureates by Thomson Reuters - which quite accurately forecast Nobel Prize winners (since they started listing scientists in 2002, they accurately forecast 35 Nobel Prize winners). It will be great to see those two esteemed inventors receive the Nobel Prize! The winners will be announced on October 8th. In January 2014, Global OLED Technology (GOT) filed a complaint in the Supreme Court of the State of New York against eMagin for breach of license agreement. 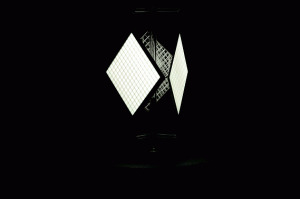 Today eMagin announced that it entered into a settlement agreement with Global OLED Technology. The two companies terminated the original patent license agreement in exchange for mutual releases and the payment by eMagin of a one-time, undisclosed settlement amount. GOT will dismiss its lawsuit and eMagin will not pay any royalties to GOT (their current product offering does not incorporate any GOT IP. Global OLED Technology (GOT) filed a complaint in the Supreme Court of the State of New York against eMagin for breach of license agreement. eMagin has been a licensee of GOT's patent portfolio (which originated at Kodak) since 1999. GOT says that eMagin breached its patent license agreement by failing to pay annual minimum royalty payments, neglecting to report or pay royalties for the sales of licensed products, and breaching certain confidentiality obligations. Dr. Ching Tang and Steven Van Slyke are two OLED pioneers - in fact you can say that they invented OLEDs back in 1987 in Eastman Kodak. The two wrote a seminal paper on OLEDs that has been cited in more than 5000 publications. Now the two pioneers were inducted into the 2013 Consumer Electronics hall of fame. Dr. Ching Tang is currently a professor of chemical engineering at the University of Rochester. Steven Van Slyke is the CTO of Kateeva - developing an inventive inkjet printing manufacturing equipment solution for mass production of flexible and large-size OLEDs. We interviewed Steven back in 2008 when he was still at Kodak. In December 2012, LG's Global OLED Technology (GOT) filed a lawsuit against Eastman Kodak, claiming that 18 of Kodak's patent actually belong to GOT. Kodak said these aren't related to OLEDs and so were not part of the 2009 deal (when GOT bought about 2,200 OLED patents and patent applications from Kodak). GOT also wanted to recover royalty payments from Pioneer that were paid to Kodak and not GOT (he Pioneer license was supposed to have been transferred to GOT but apparently Kodak wasn't able to obtain consent for the transfer). Today GOT reported that the US court ordered Kodak to assign ownership of 3 patents to GOT (US patents #6,717,560, #6,892,014 and #6,999,138). This was a settlement agreed to by GOT and Kodak. Kodak will also assign the Pioneer license agreement to GOT, including all rights to receive royalty payments from Pioneer under the license. Global OLED Technology (GOT) has filed a lawsuit against Eastman Kodak, claiming that 18 of Kodak's patent actually belong to GOT. Kodak says that these 18 patents are not related to OLED technologies and so were not part of the 2009 deal (when GOT bought about 2,200 OLED patents and patent applications from Kodak). We do not what are the actual patents involved. GOT is also seeking to recover royalty payments from Pioneer that were paid to Kodak and not GOT. The Pioneer license was supposed to have been transferred to GOT but apparently Kodak wasn't able to obtain consent for the transfer. Kodak and Heraeus have developed a new easily-patterend transparent conductive film that can be used as a cost-effective alternative to ITO in touch displays. The two companies unveiled a 14" touch LCD prototype that was was fabricated using Kodak HCF-225 Film/ESTAR base and the Clevios PEDOT:PSS coating with a surface resistivity of 225 ohms/sq. It was fabricated using conventional printing processes, including UV-cured and heat processed inks. 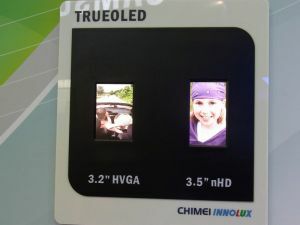 Last week we reported that Chimei Innolux are showing AMOLED panels at FPD China 2011 (which is good news as we're still not sure whether Chimei Innolux (CMI) is producing AMOLED panels or not). We now have more information on those panels. 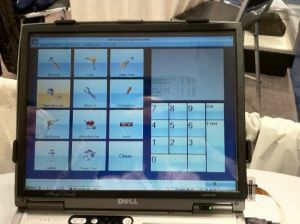 There are two panels on show: a 3.2" (320x480) and a 3.5" (360x64). CMI are calling those displays TrueOLED, but apparantly they use a white-OLED with color filters design. This is the same method that was developed by Kodak (and now LG owns that technology). This includes a white subpixel (with no filter) to enhance brightness. Other features of those panels: 300cd/m2brightness, 30,000:1 contrast ratio, 160° viewing angles and 100% color gamut for the 3.2" panel (87% for the 3.5" one). Technocorp Energy (formed by ex-Kodak employees) will license Kodak's OLED Lighting technology from Global OLED Technology (LG's company that holds the 2,000 OLED patents bought from Kodak). Technocorp plan is to produce efficient OLED panels (70lm/W) at $64/m². This will take time and a lot of effort of course, and the company is looking for funding, partners and joint-ventures to achieve this goal.